Stream anime episodes online for free, Watch One piece Episode 4 English version online and free episodes. 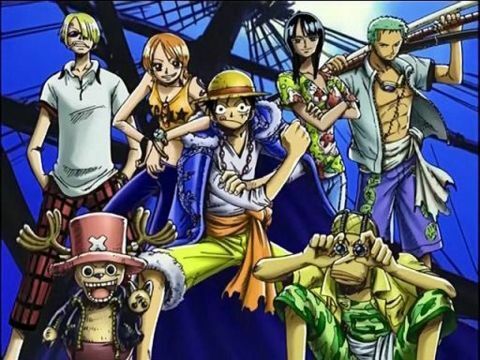 Anime Episode guide One piece Episode 4 English dubbed The Passing Of The Hat In a flashback, a seven-year-old Luffy sits in a bar filled with the pirate crew of the “Red-Haired” Shanks, beggin him to take him out to sea. But the pirate captain refuses. A bandit named Higuma enters and orders several barrels of booze. Shanks offers him the last bottle but Higuma smashes it and humiliates Shanks. After the bandit leaves the bar, all of the pirates start to laugh. Luffy gets angry that Shanks did not fight back and in a huff eats a purple fruit lying on the bar. Shanks notices this and tries to make Luffy spit it out, but it was too late. Shanks tells Luffy that he just ate the Gum Gum Fruit, a Devil Fruit, and now he is a rubber man and won’t be able to ever swim again. Later, Luffy gets attacked by Higuma and his bandits.